Unless you’ve opted for an antique carriage dating back to the 1920s, most modern prams are able to collapse small enough to squeeze into a car’s trunk. 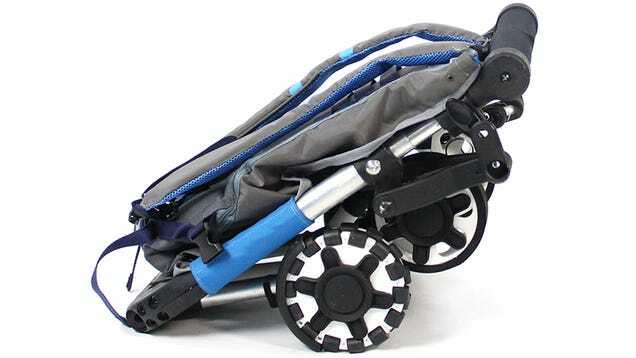 But the lightweight OmniO Rider actually folds small enough to be worn as a comfortable backpack, giving you an emergency means to transport a tired toddler without having to carry them. Its minimal frame means the OmniO Rider weighs less than six kilos, but it also means there’s not much in terms of extra storage on board. So diaper bags and snacks will have to be carried elsewhere. But it’s still able to accommodate children aged six months and older weighing up to 22 kilos with all the proper safety harnessing they’ll need to stay strapped in. Another unique feature of the OmniO Rider is its omni-directional front wheels. 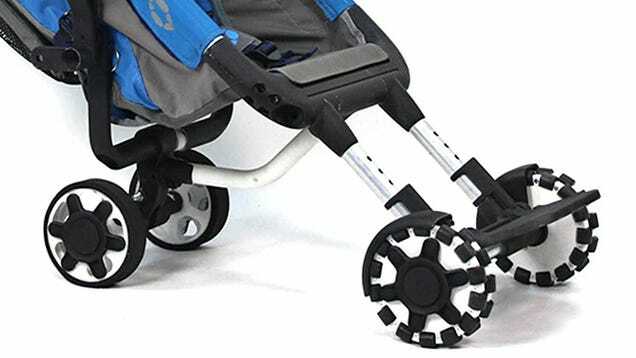 To keep the design simple and more compact the front wheels can’t turn, but are actually made up of several smaller wheels that allow the stroller to be steered left and right without just scraping across the pavement. And it accommodates a footrest so your child’s feet aren’t left scraping the ground either. It’s not really designed to be a replacement pram, most parents will probably still want something better equipped for day-to-day use. But for travelling it’s the perfect option since it even folds down small enough to fit in a plane’s overhead bins. As for pricing, you actually can’t buy the OmniO rider yet because its creators are using Indiegogo to raise the $50,000 they need to finalise the prototypes and put it into production. With a donation of $350/£236 you can pre-order one ahead of its promised October delivery. Given a lack of electronics at least software issues shouldn’t delay that estimated ETA, but it’s still a good idea to take it with a grain of salt and not get too upset if yours doesn’t arrive exactly when promised.